We’re all busy people. I know this and Mac developers know it as well. How else can one explain the veritable cornucopia of task-managing apps for our platform of choice? Many of the available task managers out there are either designed to be used with some larger workflow system (Getting Things Done, for example), or subscribe to the theory that the more features you add to your app, the better your app becomes. Check Off 4, the latest iteration of Second Gear’s task manager, doesn’t do either of those, which makes it a better application in my book. Check Off sits in your Mac’s menubar (as a checkmark icon, of course) just waiting for you to add a task. 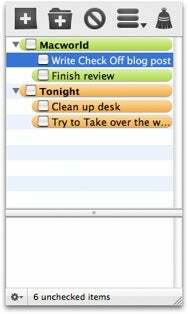 As far as bells and whistles, you can add a task with a note and organize your list using folders. Tasks and folders can both be color coded…and that’s it. Simple but effective. Version 4 sports a new, shiny interface as well as the ability to purge all your completed tasks with the click of a button. Check Off 4 also supports 64-bit and is Snow Leopard-ready, which is a pretty important feature all of a sudden. There is one big change in Check Off 4 that some users might not be enamored with: it’s no longer free. A single user license costs $12.95 and a family pack (for up to 5 computers) can be yours for $19.95. A free demo is available, but it’s limited to ten tasks or fewer.